Chances are good that the next snake you run across at your favorite fishing hole will be non-venomous, but even if it isn't, do both of you a favor and leave it alone. This past spring, on one of the first warm days of the year, I encountered a snake at Lynches River County Park near Florence the likes of which I'd never seen. It was a stunning creature, about three feet long, satiny black with a yellow-tinged chin and vivid red stripes down the length of its body. It seemed not to take notice of me as I approached it where it lay sunning on a grassy bank near the park's fishing area. As it turned over in the grass, I saw a gaudy pattern of red and black checkering its belly. 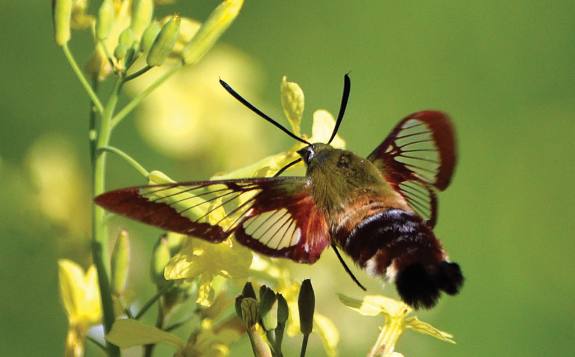 I'd never seen anything like it, and I was amazed that such a striking, exotic-looking species lived in South Carolina. Whatever the reason, it was needless and wanton. It was also routine. In the spring and summer, when snakes are active, a dead snake or two can usually be found near the fishing area at Lynches River, thrown among the half-submerged cypress knees or simply left where they were bludgeoned to death on the bank. 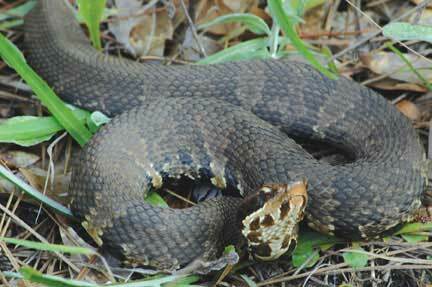 Occasionally these snakes are potentially dangerous moccasins, but, more often than not, they are harmless water snakes. It's particularly ironic that a fisherman would kill the beautiful red-striped snake I saw that day. It was the rarely seen and utterly harmless rainbow snake whose diet consists primarily of freshwater eels. Eels thrive in the creeks and rivers of the South Carolina coastal plain and are generally treated as a nuisance by anglers fishing for panfish, bass or catfish. What drives some outdoorsmen and women, the very people who use and appreciate our natural areas most, to have such a violent reaction toward snakes? Well, it's human nature to fear that which we don't understand, and snakes are perhaps the most misunderstood animals around. This is particularly true for the many species of aquatic and semi-aquatic snakes that inhabit our rivers and wetlands, since they live in the same habitats where venomous cottonmouth water moccasins are found. Maybe the person who killed the rainbow snake at Lynches River thought he was doing a good thing, getting rid of a dangerous snake that posed a threat not only to the people using the river, but to the fish population as well. If that was the case, he was wrong on both points. The rainbow snake, docile by nature like most of our water snakes, is not only completely harmless, it also serves a vital role in the ecosystem. Rainbow snakes specialize in eating freshwater eels, so they are not in competition with anglers for more desirable species. The benefit for anglers here is two-fold. These snakes keep the eel population in check, which anyone who doesn't like dealing with slimy eels on the end of the line should appreciate. By killing and eating eels, rainbow snakes keep a check on a species that is a real competitor for the fish that most anglers are seeking. 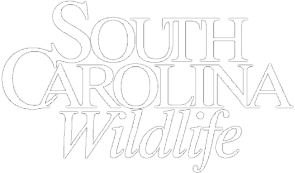 According to S.C. Department of Natural Resources herpetologist Steve Bennett, eels are far more efficient predators of other fish species than any of the water snakes found in South Carolina. But even snake species which do feed on game fish are an essential part of the ecosystem. 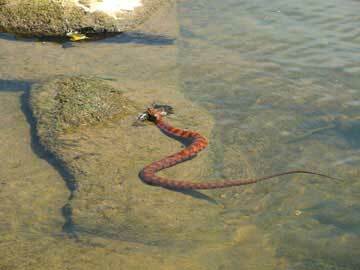 Water snakes, like the ubiquitous banded water snake, the showy and aptly named red-bellied water snake, and even the dreaded cottonmouth, keep fish populations healthy and strong by targeting primarily dead and dying fish. In doing so, they perform an invaluable service by playing a part in keeping our waterways clean. "You wouldn't shoot your garbage man, would you?" Bennett replies when asked why people shouldn't harm the snakes they encounter while fishing. Even if more anglers did understand the role that snakes play in keeping the ecosystem healthy, there would probably still be tension between human beings and snakes. For a variety of reasons both instinctive and cultural, the relationship between humans and serpents has always been a tenuous one. Since some of the snakes South Carolinians encounter in the wild are equipped with deadly venom, and identification of different species can be tricky, it's only natural to have a healthy sense of respect for all snakes. The problem occurs when that sense of respect is replaced by irrational fear. When it comes to harmless snakes like the rainbow, the instinct to blindly lash out at that which we fear is unfortunate and needless. When it comes to dealing with poisonous snakes, however, it can be downright deadly - for both snakes and people. Most poisonous snakes don't want to bite anyone and generally do so only as a last resort when they feel threatened. This means that people are far more likely to get bitten when they go out of their way to confront a venomous snake than if they simply left it alone. Poisonous snakes evolved venom for subduing prey, not intimidating humans. Because their venom is a precious commodity, they employ a wide variety of venom-conservation methods to avoid wasting venom on a defensive bite. Most of these methods are fairly obvious. Anyone who's heard the chilling buzz of a rattlesnake sounding its rattles has experienced one of the most effective warnings around. 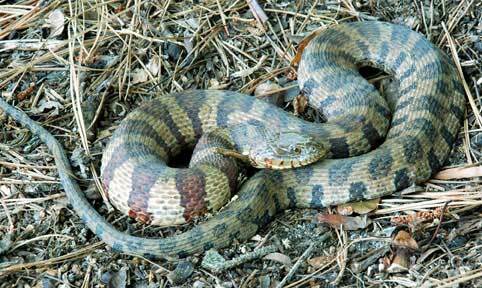 Cottonmouths, the most common venomous snakes in most parts of South Carolina, especially the coastal plain, also give fair warning long before striking. The familiar display - puffing up their bodies and opening their jaws wide to show off those intimidating fangs nestled inside their ivory-colored mouths - might seem like aggression, but really it's just a fair warning, letting us know that it's safer to just walk away. The fact of the matter is that most people who are unfortunate enough to get bitten by venomous snakes are bitten because they failed to heed these warnings. This is perhaps especially true when it comes to cottonmouths. Bennett, who's encountered more than his fair share of snakes in the wild, says that "you almost can't get a water moccasin to bite you even if you try." 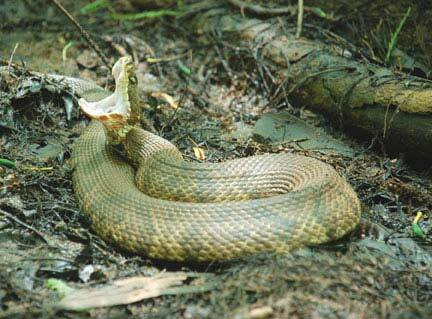 Even when irritated, cottonmouths, like other dangerous snakes, would rather try to scare a human away than bite. As evidence, Bennett cites a study conducted by Dr. Whit Gibbons of the Savannah River Ecology lab. Gibbons, a brave soul if ever there was, donned snake-proof hip waders and set out to study firsthand the cottonmouth's reaction to human beings. After beginning their threat display, none of the cottonmouths in Gibbons' study struck when he moved to within a meter. Only one-third of them struck even after he stepped on them. When he tried to pick up the snakes or handle them, however, every single one of them attempted to strike. The lesson here is clear: leave snakes alone, and they'll return the favor. The key to getting people who enjoy the outdoors to respect snakes as an important part of the natural world is education. Barry Beasley, director of DNR's Habitat Protection Section, says that one way the agency is stepping up its efforts to educate the public is by making more information available at the kiosks at DNR heritage preserve sites. For Beasley, it's all about making people more aware of the way snakes and other species are all a part of "the big picture" and have a role to play in the environment. Learning to identify and appreciate snakes is an important part of being good stewards of the earth. As Bennett reminds us, snakes are just animals, "no different than the cardinal you love so much when it comes to the feeder in your backyard." Snakes are a fascinating part of the natural world, and the best course of action when we encounter them is obvious: just leave them alone. The rainbow snake (Farancia erytrogramma) is one of the most strikingly beautiful snakes found in South Carolina. Growing to an average adult length of between three and four feet, the harmless, non-venomous rainbow snake is easily identified and aptly named. 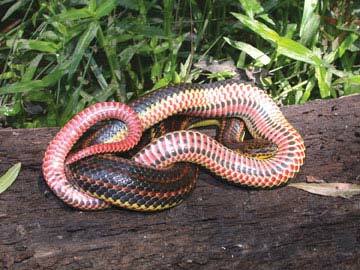 The body of the rainbow snake is glossy black with three vivid red lines running the down the length of its back. Adult specimens often have a yellow patch on the jaw and the side of the head, while the belly is a patchwork of showy red and black. They also have a spine on the tips of their tails, which they sometimes use as a probe. Contrary to myth, this spine is not a "stinger" and is, in fact, utterly harmless. Rainbow snakes are very docile by nature and rarely bite. 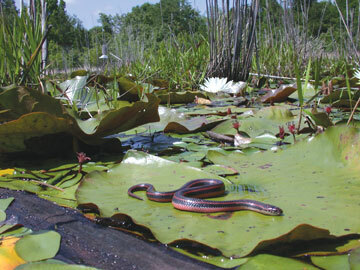 Rainbow snakes are found in the coastal plain of the eastern United States from southern Virginia to eastern Louisiana. 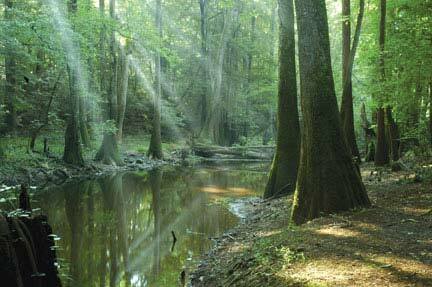 They are primarily aquatic, living in a variety of wetland habitats including creeks, rivers and cypress swamps. Unlike most of the other aquatic snakes found in South Carolina, rainbow snakes are sometimes found in brackish waters near the ocean. Sometimes called "eel moccasins," rainbows specialize in eating freshwater eels, which they eat alive and swallow headfirst. Though eels are their primary diet, they will also sometimes feed on frogs, salamanders and other small aquatic animals. Rainbow snakes are elusive by nature and rarely seen. 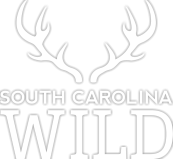 They are listed as a species of concern in some Gulf states, but the population in South Carolina is thought to be relatively healthy. 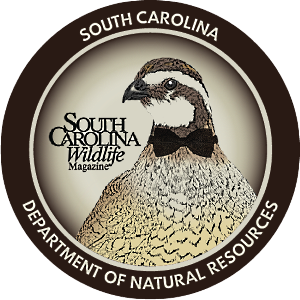 Joey R. Poole is a freelance writer, English instructor and strictly amateur naturalist living in Florence, South Carolina.